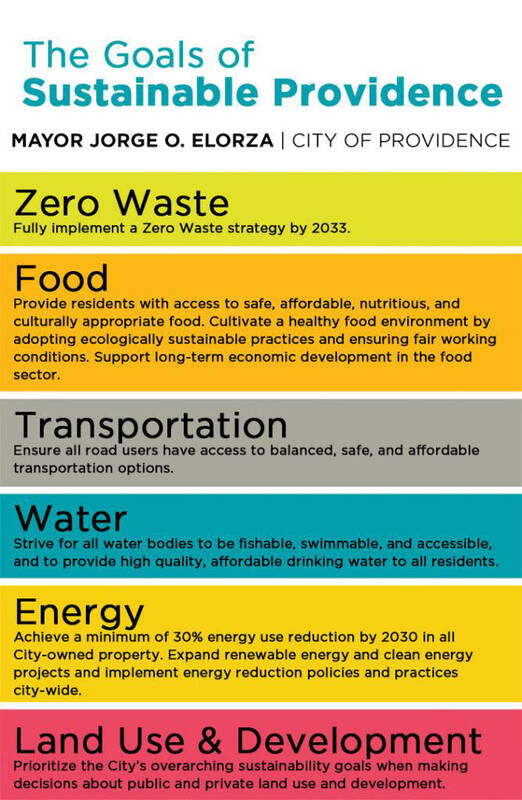 Sustainable Providence, released in September 2014, establishes 25 strategies to achieve the six goals in the areas of Zero Waste, Local & Healthy Food, Transportation, Water, Sustainable Energy, and Sustainable Land Use & Development. It includes 39 high priority actions, and identifies 27 metrics to track annual progress. The Office of Sustainability and the Environmental Sustainability Task Force coordinated dozens of community leaders and city employees to develop this plan to achieve those goals. Implementation will help build a resilient and sustainable future for Providence as we protect our environment, rebuild our economy and strengthen our community. Visit the “Take Action” page to find out how you can help Providence achieve these goals. Download the full 2014 plan: Sustainability Providence. On September 14, 2015, Mayor Elorza announced that the City’s sustainability plan will be updated to include a new citywide greenhouse gas reduction goal and will address the impacts of climate change. The resulting update was sent to the Mayor and City Council in December 2016. The Sustainability Dashboard, released in June 2017, features the latest progress on implementation of the plan, as well as data for the plan’s performance metrics.